Norm Miller and Jeff Yurek are back urging tourists to get out and visit Parry Sound and area, with their YouTube video telling tourists that Parry Sound 33 isn’t burning up the whole riding. QUEEN’S PARK — While Premier Doug Ford was promoting “Buck-a-beer” Tuesday, Jeff Yurek, his minister responsible for fighting forest fires in Northeastern Ontario was urging tourists to spend “some extra money” when visiting near the Parry Sound 33 forest fire. 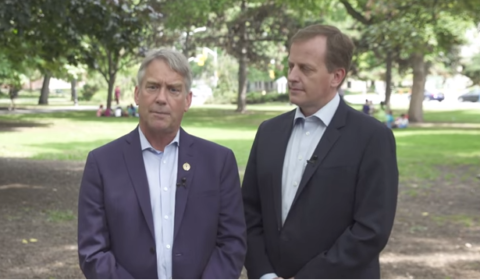 Local MPP Norm Miller and Yurek have been on the bandwagon since last Friday telling the world the fire doesn’t affect the whole tourism region and that it is open for business. They produced a quick YouTube video (see story elsewhere on MuskokaTODAY.com) on Friday to say as much. They previously joined Ford in a visit to Britt and the control centre where MNRF staff are plotting strategies to fight the large number of fires. During question period Tuesday in the Ontario legislature, Parry Sound-Muskoka MPP Norman Miller asked Natural Resources and Forestry Minister Yurek for an update on efforts fight Parry Sound 33 forest fire. Miller said in a release he was “pleased to hear” the perimeter of the fire had been held over the weekend and that as a result of crews laying more than 300,000 feet of hose to maintain that perimeter, the fire should not spread any further. In fact, crews are now working inward from the perimeter to fight the fire. Miller pointed out the impacts of this fire have been felt far beyond the evacuation areas. Miller and Yurek has The media attention has scared visitors away from the Town of Parry Sound during the important summer tourist season. Mr. Norman Miller: My question is for the Minister of Natural Resources and Forestry. The forest fire burning in the north end of my riding since July 18, known as Parry Sound 33, has destroyed a huge area of more than 11,000 hectares and, despite being about 75 kilometres north of the town of Parry Sound, has scared a lot of people away from the whole area during this summer tourism season. I recently heard that there have been some positive developments regarding this fire. Can the Minister provide the House and the public with an update on the efforts to battle this forest fire? Hon. Jeff Yurek: Thank you to the member for Parry Sound–Muskoka for that question. I just want to take this opportunity one more time: On behalf of this Legislature and on behalf of the people of this province, I want to thank the fire crews that are working day in and day out and thank the support staff for taking on these fires and ensuring we keep the public safe and keep our properties safe. Mr. Speaker, I’m happy to report that over the weekend, Parry Sound 33 fire—that the fire perimeter has been held. Crews have been able to lay over 300,000 feet of hose to help establish this perimeter around the entire fire and ensure that it’s not spreading further. In many places, crews are now working steadily in from the perimeter to fight this fire. While this progress is good news, evacuation orders and travel restrictions remain in place in the area. These measures have been put in place to ensure public safety while allowing fire personnel to safely and effectively suppress the fire. I do want to say, Mr. Speaker, that if you’re going up to Parry Sound, go up and spend lots of money. Let’s support northern Ontario; let’s support their economy. The Speaker (Hon. Ted Arnott): Members will please take their seats. Supplementary. Mr. Norman Miller: Back to the minister: Thank you for that answer. I know the people of Parry Sound district will be pleased to hear the fire is no longer spreading. Most media coverage has been on the Parry Sound 33 fire; however, there are other large fires being fought in northern Ontario. Can the minister provide an update on fire-fighting efforts in other parts of northern Ontario? Hon. Jeff Yurek: Thank you very much for that supplemental. I’m happy to report that a combination of improved weather over the weekend and the ongoing work by crews and teams across the province has led to an improved situation on many fires in this province. Of note, the fire in Lady Evelyn-Smoothwater Provincial Park in Temagami, one of the largest fires in the province, is now being held. Provincially, resources are in good supply and most of the actionable fires have received the support they require. We again would like to commend the hard work and dedication of those who are fighting the fires and, at this time, also thank our partners: the other provinces that have sent help and the United States and Mexico for sending us their support, their firefighters and their equipment. We will continue our fight against these fires until they are out. Thank you very much for that question. « New Parry Sound 38 fire quickly put out; but 33 still out of control	» Hort Flower & Vegetable Show today, Aug. 8, from 2-4 p.m.